Phrases like “Together we can make a difference” and “It only takes one person to make a change” are calls to action for community programs, charities, and other good causes. Engaging in Pro bono projects, Pro bono meaning “for good”, can give you the chance to create with new people and possibly craft something very different from your day-to-day work. For me, offering creative services contributes to a greater good. The good that quite unexpectedly found me was The Joe Beretta Foundation. The foundation’s mission is to establish a community of strength and meet the needs of heart failure patients, especially those needing an LVAD (left ventricle assist device). Family support is vital for weeks if not months after the surgery. One of the largest burdens not covered by insurance is housing. 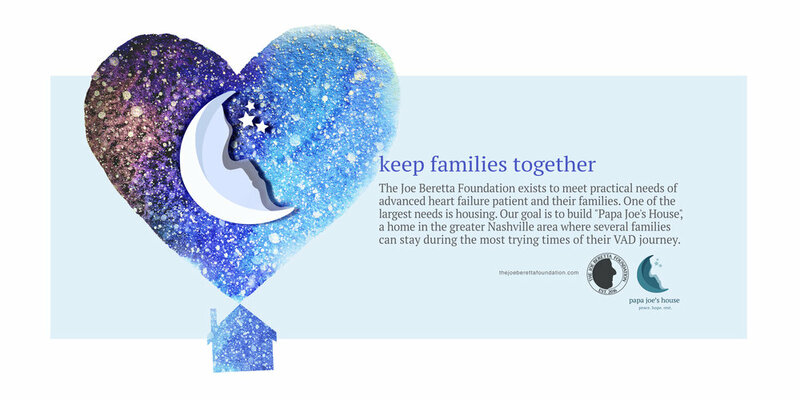 The Joe Beretta Foundation’s goal was to build a home in Nashville where several families can stay together during the most trying and frightening times of the LVAD journey. I first heard about the foundation from an associate and friend, Angelo Roman, who is a board member and fundraising committee chair. One evening we had a conversation about work, projects, and giving back. He told me about the foundation and mentioned that they could use some help on an identity for the home. That was a great fit for me. Several years earlier I had a close friend whose child had an extended stay at a Ronald McDonald House. For families in crisis, the support and the way their lives were touched was unforgettable. The dream of providing hope, safety, and resources for patients and their families became the quest. The design brief wanted to avoid ME TOO executions. The group also wanted something warm and inviting. One challenge that became a major positive was that the foundation already had a very unique and personal logo. The profile of the actual Joe Beretta made up the emblem for the foundation. It was the love and respect for Joe and his family that drove the execution of that design. Several initial concepts seemed to have good movement. A watercolor nest was illustrated symbolizing a place of retreat, rest, and lodging. Another was a sun with a graphic Joe profile. I liked the idea of Joe being part of a new day; a sunrise and hope in moving forward. The one that ultimately clicked was the Moon design. This design utilizes the actual profile art from the foundation logo. Joe was now a peaceful, evening light-set in the stars, providing illumination and hope for those who need him. The logo has worked well for the cause and a second mark for the BRAVEHEART LUNCHEON fundraiser event has been created. As a designer there are some projects that are just flat-out fun to work on. This was the perfect balance of fun, challenge, and reward.